For years now I personally have been convinced the DWF format is far superior to the PDF format. Until recently I represented a small minority, as most people still preferred the older and more established PDF format. In the past year or so it seems that the tides are changing, and more people are willing to check out DWF’s and what they have to offer. Personally I think a number of variables have started the changing of the tides. It seems that the combination of Autodesk making their Design Review software a free download, and more reprographers accepting DWF’s electronically have been major factors in the recent shift. Oftentimes it’s not necessarily obvious what has changed between different versions of a plan sheet. Sure some changes are overly apparent, but what about the subtle changes? People still married to their slide rules might take a print of the old and new plan sheet to a light table and see what pops out at them. While that method may have proven effective in the 20th century, this is 2007 baby! Autodesk Design Review offers a rather intriguing alternative to the old light table with its “compare” feature. Essentially Design Review can compare 2 DWF’s, and it will highlight the items deleted in red, and added in green. Such color coating makes the exact changes to a given plan sheet overly apparent. 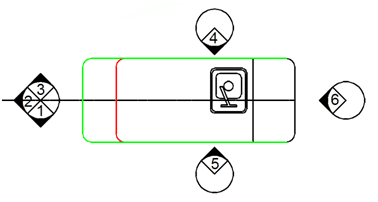 So just how does one flip the switch on the digital light table? All that’s really needed to “flip the switch” is 2 DWF files. The first DWF should be the latest print of your plan sheet. We will compare the new DWF with a second DWF created at an earlier date. Open your latest DWF file. Go to the Tools menu and select Compare. 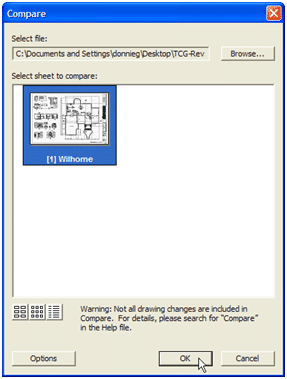 Browse to your second drawing, and select the sheet you would like to overlay, or compare. After pressing Ok, Design Review will think for a moment, and finally display the changes. Again by default new items are shown in Green, and deleted items in Red.